An 81-year-old bicyclist who had been a professor at the University of Maryland died after he was struck by a vehicle in Bethesda Monday morning. WASHINGTON — An 81-year-old bicyclist died after he was struck by a vehicle in Bethesda Monday morning. 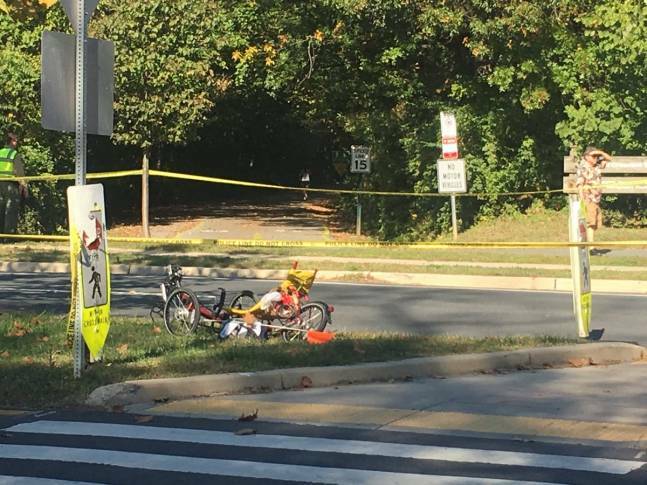 The biker, identified as Ned Gaylin of Chevy Chase, had been struck by a 2002 Mercedes E320 driven by a 78-year-old man at the intersection of Little Falls Parkway and the Capital Crescent Trail around 11:30 a.m.
Gaylin, who had been an esteemed professor at the University of Maryland was riding a three-wheeled recumbent bike in the marked crosswalk at the time of the collision, according to Montgomery County police. Emergency crews transported Gaylin to an area hospital. Initially, it appeared as if the Gaylin sustained non-life-threatening injuries, but he later died, said Montgomery County police spokesman Capt. Paul Starks. The driver of the Mercedes was not injured, police said. Gaylin was the founding director of the couple and family therapy program at the University of Maryland’s School of Public Health, according to a professor at the school. He was professor emeritus at the Department of Family Science. Montgomery County police are investigating the crash and are asking anyone with information about it to call them at 240-773-6620. It is not yet clear how fast the vehicle was going when it struck the cyclist. The speed limit on the road is 35 mph. Below is a map with the location of the crash. WTOP’s Mike Murillo contributed to this report from Bethesda.